This combination helps to free the soul of the animal. It releases the problems and sufferings the animal has taken over from the owner. It also releases the problems and sufferings that are done to the animal by humans, both on a conscious and on a subconscious way. Many problems of the animal are connected to the tensions and stress of the owner. The combination gives the animal the feeling of freedom and makes it feel calm and at ease. It connects the animal to its original strength and being, so that it can live to the original purpose of its life. When you add up the qualities of the first four essences of the new times you end up at the new essence Earth-Creation. This essence is made of a power place in the north of Sweden. In the middle of a meadow is a hill of stones, where the flames of the energy of the earth come up. In these flames a green archangel is visible and this archangel connects you with the stars and the universe and brings the star children to the earth. This archangel brings everything that is still left in the soul and the mind, and has not been able to incarnate, to the earth. The archangel gives the peace and the faith to be, without struggle, to stand in your power without pain and to give you deep roots to complete your incarnation on earth. She brings you in connection with your natural rhythms and connects these with the stars and with the earth. She has the quality of integration from the stars and the universe, the healing of the heart of the earth, the heart of the universe and the heart of mankind. She brings humans to a new level of understanding, through which she brings the change to open the doors of your heart for the stars, the earth and the universe. A cycle of healing of the human race that begins with a true expression of love, the opening of the heart and the search for real healing in yourself. Important in this process is that you don't look at the other or in the group for it, but that you try to find your own way, despite all adversity. Many seekers have had chopped their heads off for ages, so to say, you stick your head above the surface level and you are put back on your place and opposed. By using the Earth-Creation essence you connect yourself with this portal, this power place and from there you go your own humble way (there is no other) to connect you with the whole. This direction is now supported by your higher healing power, it puts you on the way to find healing in yourself on all levels. Earth-Creation helps you to release what is not important for the fulfilling of the unique roll of man in the universe and lets you descend to the earth to a level of totality, to go back from there to the level of the angels, to be healed after a long search for the original source. The essence allow you to be open and warm towards others, while you can still stay yourself. The contact with your soul and the purpose of your soul become clearer. It helps to release what hinders your evolution. To stay in your own power and accept others as they are. Gives you a feeling of freedom, joy and openness, because you act more powerful and more secure. The Stinging nettle is chosen for the earth element. The stinging nettle gives you a good connection with the earth, so you can cleanse and purify. Good to connect you with the other through your base, your roots, but still stay yourself. Gives protection and a connection with the earth. Allow yourself to descend on earth, to take your responsibility and not run away when too many people come up to you. The Burdock is chosen for the space element, to have enough space for yourself and take your own space. When you are closed in, locked up and cannot make the connection with the higher. 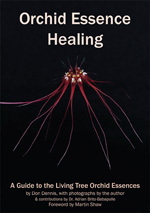 Gives release and lets you take your own space, while you can heal and nurture it from your higher self. The flowers of the Impatiens are chosen for the water element. Impatiens helps you to make the connection with the higher in your own pace and on your own way. Don't let yourself get disturbed and limited by what's going on around you, but go along with your higher development. The Tansy is the plant chosen for the fire element, your power and the connection to your power. The - 4 Mushroom Combination - is for expressing yourself, for your manifestation, be able to express yourself in the most powerful way. When you have made the integration of the female and male, but the intuitive, the higher is still too new, you don't have the courage yet to take the next step. It is for the nurturing from the higher and the freedom of your heart. This combination helps you to release old adjustments to others and removes the mess you have taken on from others. It gives you the faith and the courage to let go, that's why you can break through old layers and patterns, that would otherwise cause a blockage. You don't adjust to the prevailing standards, but act and manifest clearly from your own rhythm. It helps you stop your worrying and brings you to the core of a problem. It is good to take it in combination with the Coprinus auricomus. When you were not able to create what was necessary for your soul and this caused health problems, the - four mushroom combination - brings the not formed structures into form. A combination to protect against the radiation of cell-phones. You can hold the essence near to the phone when you are using it. You can also put a little bit of the essence on the head in the area where you hold the phone. When you have already pain in your head because of too much use of the cell-phone, you can put a drop of this combination on the painful spot several times. It is also good when you are too sensitive for electricity. A remedy for integration, protection and the resolution of old emotions which have not been integrated. Whenever in a given moment of your life the hold on of your life was been lost and in the end never really worked through. It helps you to let go of the old and gives insight into how the problem came about. This can be related to past relationships, but also to past misfortunes and abuse. In all situations in which you have been hurt and offended and you have lost control over your life, even sometimes just for a moment. Often this deprives you of a feeling of fullness and trust leading to a persistent sensation of vulnerability. This remedy re-establishes the link with the Higher Self, integrating the various processes of recovery and giving protection and confidence. The 'Living Star Light' is not a combination and not a flower essence, but it is a cosmic essence. This essence connects you with your natural earth being and with the stars. It is an essence from a five-pointed star, with three points directing horizontally, one point directing down and one point directing up. The essence gives relaxation and releases everything that is not part of your being. First it helps you to find the wholeness of your being on earth and then the essence deepens the connection of your being with the earth and with the cosmic energies. A combination of Borage, Foxglove, Greater Celandine, (red) Poppy, Red Henbit, Snowdrop and Yellow Star Tulip. The seven beings of Light. A combination to awake the Love for yourself, others and the earth. First it helps you to connect your being to the earth, then it helps you to open your heart for the care and Love for your own being and as result of this you will be learning to give this Love out to others, without self-denying. A powerful catalyst which connect you to the higher light and your Angel of Love. Provides protection from the spiritual worlds and the help of loving forces from on high, 'angelic protection' especially when one crosses the threshold to the 'other side', for example in situations such as death or passing away, dreams, meditation, operations or serious illnesses, when the mortal body is less bound to the earth. It provides spiritual protection for the infant during pregnancy, favors a more spiritual development of the consciousness and strengthens the ability to experience loving spiritual forces in your life and work. It promotes the search for and the use of spiritual insight. In this way it encourages growth and protects the consciousness; it increases trust in the leadership of the Higher Self when confronted with unknown areas - a 'Godly' trust with a good earth-bound feeling without doubting your personal Wisdom. In the beginning this essence was used as a combination for head-aches. The combination purifies your soul and your body and connects you to the earth. It makes you feel fit, better in your body and connects you to the original purity of your soul. The bridge between Heaven and Earth; a combination essence for personal development, made from the flowers of Borage, Impatiens, Moneyplant, Red Henbit and Red Poppy. Brings creativity and development. While the flower essence 'Terra' helps us make the vertical connection to the earth, the Rainbow essence also works horizontally; it brings expansion and new impulses; stimulates new activities; opens all chakra's and helps break barriers that block our development; brings awareness to the process of development. To find your spiritual direction. When you have made choices in the past that were not made out of a spiritual direction and when you have put the material world and material things as most important in your life. This combination starts to change the choices you have made in the past and gives you the insight that there is no material world without a spiritual world.